Gardening is a great hobby for all ages, and the younger kids start gardening, the better the chance they will develop a lifelong love of outdoor activities and fresh, healthy food. Even the youngest children can join in gardening activities, and older children can enjoy their own planting-to-harvest gardening adventure. In addition to these lessons, children can learn many useful qualities from gardening, such as patience, hard work, perseverance, and responsibility. Choose Kid-Friendly Plants: Flowers, fruits, and vegetables with shorter maturation times are best for kids, so they don't have to wait so long to see the results of their efforts. Durable, forgiving plants are also ideal for novices, and plants that have a useful result – something to eat or flowers to pick – will interest kids more. Top kid-friendly plants include sunflowers, cosmos, carrots, peas, pumpkins, tomatoes, and strawberries. Get Dirty: Kids love to dig in the garden, and it is important that they are allowed – and expected! – to do all the necessary gardening chores. This includes not only preparing the soil, but also planting, weeding, thinning sprouts, training vines, harvesting produce, and removing dead plants. Each step is an opportunity to teach children how a garden grows, and how to help it be as healthy and productive as possible. Create a chore chart to keep them on task with everything the garden needs. Use Kid-Sized Gear: Regular garden tools can be too heavy, long, and unwieldy for little hands to use effectively. Opt for child-sized tools so kids can learn to use the proper equipment in the garden. When child-sized options are not available, assist kids as necessary and always supervise their efforts for safety. 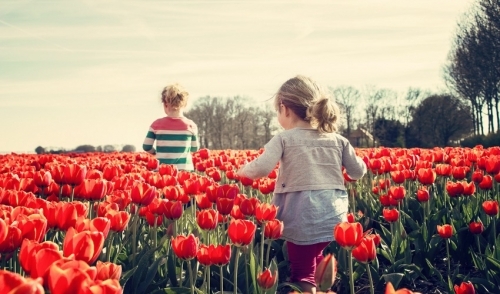 Give Kids Space: Children will enjoy a garden they can think of as completely theirs, so it is important that they have their own space to use. Small children may be better able to manage a container instead of a full garden, or a raised garden bed can be a more child-friendly size. If those options aren't available, dedicate one row or patch of the garden just for the kids. Teach Techniques Gently: While it is important to teach children proper gardening techniques, don't expect them to emulate your experienced hands exactly. Guide their gardening, but don't dictate every step of the way. They will learn through trial and experience just as you did, and while you can share your expertise, let them take ownership of their gardening efforts. Follow Through: After the garden matures, help children enjoy the rewards of their labor just as much as the actual tasks of gardening. Use their fresh fruits and vegetables in recipes, give produce or flowers as gifts, and praise their results. That positive reinforcement will help them enjoy gardening and be eager to plant anew next spring. The most important thing to remember when gardening with kids is to just have fun. If they have an enjoyable experience in the garden, their interest in gardening will sprout and grow, leading to a lifelong love of gardening that will bring them benefits throughout their lives.